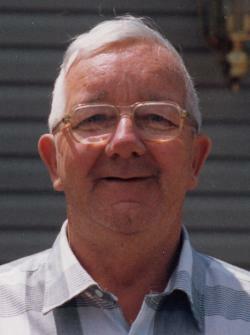 It is with deep sadness we announce the peaceful passing of Ronald "Buddy" Aubrey Holmes, age 87, of Moncton, NB. Ronald passed away at the Dr. Georges L. DuMont Hospital on Thursday, July 19, 2018. Born in Sackville, NB, he was a son of the late Harry and Rheta (Hicks) Holmes. Ronald was employed at the Moncton City Hospital for 15 years as a custodian. He loved to go for walks with his friend J.J. He enjoyed time at the mall with friends Flossie and Robert, and meeting up with numerous other friends. He loved his family deeply, was very devoted to his grandchildren, and cherished every minute that they had together. He will be sadly missed by his daughters Sally (Robert) Walton, Moncton NB; grandchildren Donna (Matt) MacLeod, and Jodie (Tina) Suley, all of Moncton; great grandson Damon MacLeod, Moncton brother Arthur (Linda), Jolicure NB; sister Rhoberta (Thomas) Steeves, Jolicure, NB. He was predeceased by his wife Rita (Cormier), daughter Janet Holmes and a sister Hazel (Wesley) Estabrooks. Funeral arrangements have been entrusted to Jones Funeral Home, 70 Bridge St., Sackville, NB (506-364-1300), where visiting hours will take place on Saturday from 2 to 4 and 6 to 8 pm. Ronald's funeral service will be held on Sunday, July 22, 2018 at 2 pm from Jones Funeral Home, followed by burial in the Sackville Cemetery, Life Celebrant Scott Balser officiating. Donations can be made to the Heart and Stroke Foundation or a charity of choice. Sharing of memories and condolences may be sent to the family by visiting Ronald's online memorial at www.jonesfuneralhome.ca or through the Jones Funeral Home Facebook Page.